The South Sound is filled with small, charming locally owned independent nurseries in out of the way places…some so out of the way that even Google Maps gets confused. They are deep in residential neighborhoods, at the foot of Mt. Rainier and along country roads. Smaller nurseries have something the larger ones may not be able to offer…they have that personal touch. Old Goat Farm in Graham is one of those Google Maps challenges, but once you find it, you won’t want to leave. There is something very comforting about it. Greg Graves, the horticulturist, and Gary Waller, the clever designer, run the nursery and tend the garden that runs along one side of a Victorian farmhouse. Behind the house and garden is a critter-filled farm with goats (of course), ducks, geese, chickens…lots of birds. 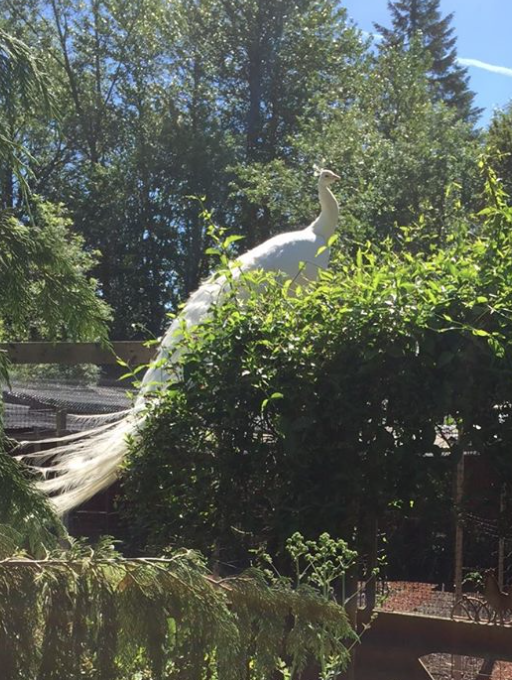 It’s worth visiting just to see Casper the white peacock when he decides to fan out his enormous feathers. The nursery runs alongside the other side of the house and spills over onto long tables. It includes five species of peonies that Greg grew from seed. The garden near the nursery area is filled with the 25 truckloads of plants that Greg and Gary moved from a previous garden into Old Goat Farm. They called those truckloads their “starter garden”. I’m pretty sure that qualifies them as plant nuts. People who have visited Old Goat Farm generally return because the place just feels good. Greg conducts horticultural tours for the Northwest Horticultural Society and has a world of plant knowledge to share. Gary as the designer leaves evidence of his touches throughout the garden. 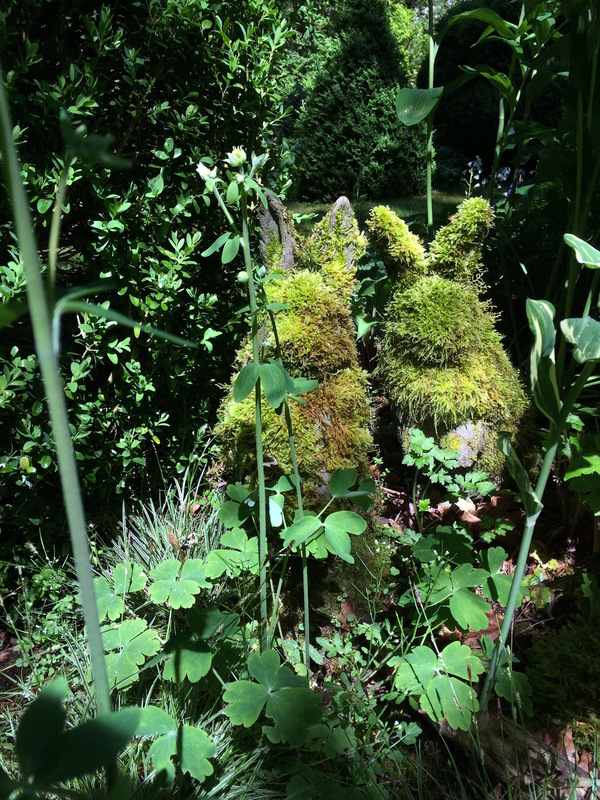 It takes several walks through to see all the cleverly completed projects…see if you can find the moss covered concrete bunnies hidden under a Hammamelis. Vassey Nursery is set deep in a residential area near downtown Puyallup. Like many small nurseries, Worth Vassey’s began as a hobby. His greenhouse was full of geraniums, fuchsias and tomatoes. He overwintered fuchsia baskets for many gardeners in the area and began to grow a business. Then his son, Steve, kicked it up a notch. Vassey’s is now a thriving neighborhood nursery with 14 greenhouses and a beautifully landscaped compact ornamental garden that skirts the well-grown trees, shrubs, perennials and annuals. Walking through Vassey’s is nothing short of inspirational. The nursery is well known for its hanging baskets, especially geraniums and mixed plantings. Carrying on the tradition of his father, Steve grows a wide variety of tomatoes and has added hardy fuchsias to his plant portfolio. Travis and Gabe…the Gardensphere brothers, have created quite a unique neighborhood nursery in a small lot at the lower end of the popular Proctor District in North Tacoma. They started the nursery 13 years ago when they were 21 and 18. They started with a landscaping business and then opened the nursery. They soon discovered that they liked the nursery work better so they quit landscaping to concentrate on the nursery. Travis is the plant nut and Gabe handles more of the business end but Travis is quick to point out…”We’re both strong on chickens!” This very urban garden shop is a source for all things chicken coup related, a trend that doesn’t seem to be slowing down. Gardensphere is like “Cheers” without the bar where everybody knows your name. It has a quiet energy about it. Travis says that their customers come back because of the attention they know they’ll get. The Barn Nursery on old 99 near Rochester has been a community resource for Olympia for 30 years. It is the largest of these independent nurseries. The Barn has grown into a popular destination nursery partly because of the accumulated experience of its staff. Chris Watkins is a perfect example. Chris has been at The Barn for about 25 years. Why does she like working there? “Why the plants, of course and the people I meet on a regular basis…the ever increasing changing world of plant offerings”. Chris’s nursery experience naturally spills into her home garden which she admits is a garden of “trials and errors”. It’s far too tempting to be surrounded by new plant varieties in the nursery and not take them home to try them out. After many years of experimenting she knows the “tried and true” plants that grow well. She can confidently answer questions about plant habits and make suggestions to meet her customer needs. Whatever the plant, she probably grew it and if you don’t grow it, you don’t really know it. Gartenmeister Plant Shop is one of those timeless nurseries that somehow feels familiar…like you have already been there whether you have or not. It sits on about 2 acres of a working nursery. It hasn’t changed much since 1983 when his parents opened the doors. Owner Clem Manual and his customers like it that way. Visiting Gartenmeister is a little like going back in time…no website…nothing flashes…no computer generated signs…just a friendly atmosphere and people who know what they’re doing and know what they’re talking about. 20021 Orting Kapowdin Hwy. E.
16015 81st Ave Ct. E.